Artfiles Review 2019: Is Artfiles a Good Hosting? Hamburg, Germany-based Artfiles is a hosting company offering low-cost shared, cloud VPS, and dedicated hosting plans. It has grown steadily since its inception and has built a local reputation for affordability, reliability, and strong customer service. Artfiles (also known as Artfiles New Media GmbH) was founded in 2000 by four entrepreneurs in Hamburg, Germany, as a company that provided hosting off of a single server. The team has since grown to 19 people, and the company now offers a wide range of shared, cloud VPS, and dedicated hosting plans. Artfiles has built a solid customer base in Germany as a value-priced web hosting provider that backs up reliable hosting with good customer service. Artfiles offers six shared hosting plans, from Tiny to Professional. The Tiny plan lives up to its name: with storage of a meager 5MB, it’s only good for hosting a very small, basic website. The rest of the plans have fairly good features and all come at very reasonable prices. There are three cloud VPS hosting plans, stepped up by processing power, RAM, and storage. These plans can be finely customized in small increments. For instance, you can add an additional 2GB memory to a plan, or an additional CPU core. The combinations are practically endless, giving a great deal of flexibility to address specific needs. All feature daily backups. However, Artfiles does not offer many of the extras that you will commonly find on offer from larger hosting companies. There are no uptime guarantees, and you won’t find any SSL certificates or CDNs on offer. It doesn’t give you a free domain registration with plans or free website transfer services. All in all, while Artfiles has a decent selection of plans, it isn’t the most beginner-friendly host, nor would it be a great fit if you’re looking for the best possible server performance. Artfiles offers one of the most inexpensive shared plans in the world, but it comes with extremely sparse features. There’s a also a one-year minimum term for that plan and a setup fee that effectively doubles its price for the first year. Overall, it’s hard to shake the feeling that the Tiny plan is anything more than an enticing loss leader. That aside, the entire line of hosting packages is affordably-priced, so you do get good value. But given that Artfiles does not throw in any extras, it seems like there is better value to be found elsewhere. There’s a 14-day free trial available, if you’d like to test out the Artfiles platform. 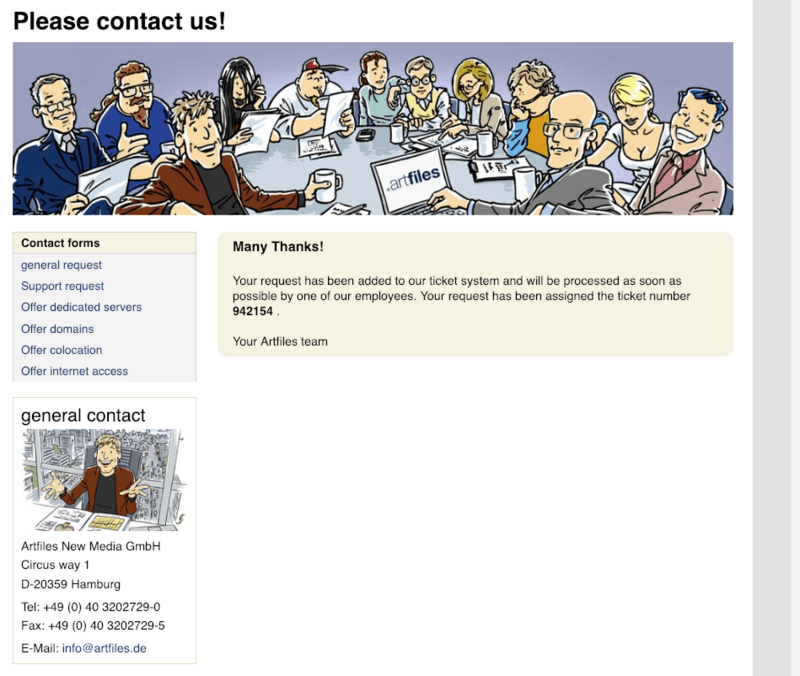 Artfiles offers phone, email, live chat, and ticket support. It also has a knowledge base with a good selection of tutorials. It seems to have earned a reputation for excellent support based on its social media reviews, though take note that most of its customers are in its local (Germany) time zone. Phone (and fax) support are limited to regular business hours in Germany, which will be impractical for users in other countries. Inquiries made through the website in English did not get a prompt reply. Artfiles definitely seems geared toward a German audience. For that target market, it provides a solid service at a low price, backed up by good customer service during business hours. However, if you don’t live in Germany and/or speak German, it may not be a good choice. Wondering how Artfiles stacks up against other Web Hosting companies? Enter any other Web Hosting company and we will give you a side-by-side comparison.